Finally it’s time for our beloved NFL season to begin. I’m looking forward to seeing one of my favorite quarterbacks, Peyton Manning, line up for the first time with my home team, the Denver Broncos. But there’s another new development on the field that’s just as exciting to me: The San Diego Chargers play the Green Bay Packers on Thursday, and if you’re paying attention, you’ll see something you’ve never seen before. Shannon Eastin will be one of the referees. 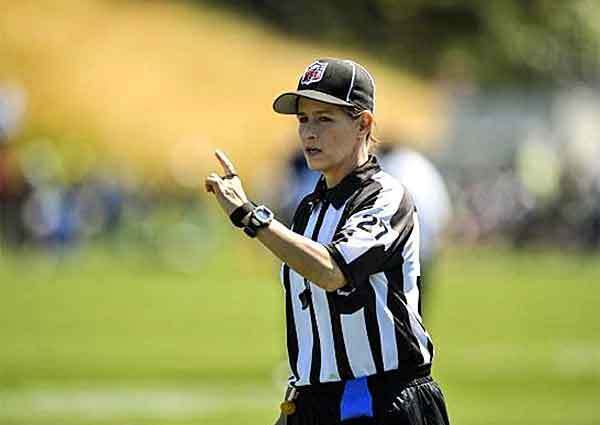 Yes, you read that right, a woman will be officiating at a football game for the first time in NFL history. The regular officials are in a lock-out so the NFL had to hire a replacement crew. Shannon made the cut. There is no word as to whether she’ll keep her position once the lock out is resolved, but for now, she’s on the field. It’s a very exciting development for those of us who happen to be female and enjoy the game as much as most guys. The percentage of fans who are not male has increased so much that the NFL shops are finally making fan clothing in women’s styles. And now we have a ref on the field. That’s a lot to cheer about. Shannon is not a stranger to being a trailblazer. At age 11 she was the youngest person to ever be admitted to the United States Olympic Training Facility. She’s won six national judo championships. Clearly, this is a woman who knows what she wants and works hard to get it. So if you’re an NFL fan, like a handful of us GeekMoms, keep your eyes open this season for a new face in the black and white stripes. She’ll be running up and down the field, just doing her job. But once the game is over, she’ll be the one with a ponytail falling out of her regulation officials hat.